In the next couple of weeks we will be sharing a Christmas security tip every other day so that you can sit back and enjoy the holiday period without worrying about the security of your home. 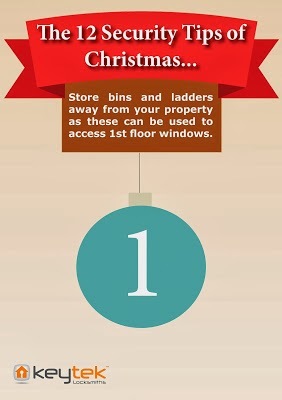 "Store bins and ladders away your the property as these can be used to access 1st floor windows." Don’t give a burglar a leg up! The majority of leading home insurance providers will recommend that it is always a good idea to lock up anything that can be used by a burglar to gain entry to a first floor window or climb over a fence i.e. wheelie bins and ladders. Home insurance provider Saga advise that all ladders should be securely locked away in a garage or shed. If you are using a garage or shed with windows to store anything that can be used by a burglar to gain entry it is also good to have curtains fitted to stop anyone from seeing in! Really good post, Christmas is a hot time for break ins, we always encourage any customers to really take care when doing any self-improvements concerning security to their home.